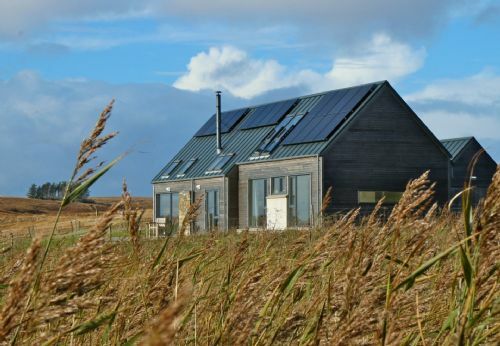 The Lewis Longhouse is a new, luxurious holiday home-from-home; visitors can enjoy a luxury self-catering break in this gorgeous house in the Scottish Outer Hebrides! On the east coast of the Isle of Lewis, it sits close to the beach in an area of peaceful, natural beauty with wide, uninterrupted views. Its low-impact building is a stylish and modern take on traditional island houses, with contemporary design and energy-conscious technology. The Longhouse is fully equipped to the highest standard to make each stay a pleasure, in an idyllic location to explore the island. A stunning and spacious double-height living space with floor-to ceiling windows, two large bedrooms to sleep 4 people in total, two bathrooms and a quiet area upstairs to put your feet up, but with wow views, make this a special place to relax. We had a fantastic time at this lovely property. It was beautifully designed with great attention to detail and amenities. The host was very nice over the phone and Anne, the person that met us at the property, was very thorough showing us the house. Would definitely come back for a longer stay.... maybe in the summer! Was there anything in particular that you liked, or disliked, about staying in the Longhouse? As we continue to keep the Longhouse special, is there anything we could incorporate to make a difference or add a new wow for you next time? The Lewis Longhouse was a breath of fresh air to stay at. Lovely rooms, with luxurious bathrooms, and an incredible common area. It was as relaxing and gorgeous as it was comfortable. The kitchen has really nice dishes and pots and pans, which is rare for a rented house. It seriously felt like a home away from home with things we would have stocked it with. This review is short, but we're already trying to figure out when we can make it back because this place gave us the time and space to decompress and relax in a way that we haven't done in years. The one thing I disliked was there aren't any toilet paper holders. It's such a minor thing compared to the rest of the house that it's hardly worth mentioning. The wood fire stove was absolutely lovely and the upstairs was so tranquil. A hot tub? That seems a bit over the top, so not really. It's already so lovely. This is probably the best self catering property I have ever stayed in, and I have stayed in quite a few! It is very spacious with a lovely open plan living area, mezzanine floor where my daughter loved to sit by the window and read/draw, utility room, 2 generous bedrooms, an en-suite and separate bathroom. Everything about it oozed quality. The superkingsize bed was firm and so comfortable. I loved all the local Harris tweed furnishings, specially the dogs!. The property is incredibly well equipped with everything you could think of, and some you wouldn't have! There is a decent sized TV with a box of DVDs and a large box of games, both of which we used. There are lots of books on the shelves, including cookery books, which makes it really like someone's home rather than just a holiday house. There are lots of thoughtful little touches around the house, which makes your holiday extra special. It was warm and we didn't need to use the wood burning stove. Mairi was waiting for us to show us around and Anne popped in before we left. The welcome basket (milk, butter, wine, oatcakes, local smoked salmon and Stornoway black pudding) was a lovely touch, and the home baked cupcakes beautifully decorated and very moreish. There are lots of basic store cupboard provisions too (oils, vinegars, herbs, stock cubes etc) which is really helpful. There are uninterrupted views across Coll Bay. The location is very practical for exploring the island. There is a garage very close by for petrol and basic provisions. Stornoway is only about 7 miles away, with 2 big supermarkets and local shops. It's on a bus route, although we didn't use it, and you can walk across the road and down onto the beach where we saw pilot whales one day. The sight-seeing booklet I received before we went was really useful and we followed almost all the suggested routes. Booking with Linda was easy and emails were answered by return. There is also a folder full of local info including restaurants etc. There is a lovely outdoor decking area and picnic table for fine days. In summary, a fantastic stylish and spacious house in a great location on a stunning island. It is expensive, but you get what you pay for! Liked - pretty much everything. Disliked - water pressure in the ensuite shower was adequate, but not fantastic, but that's probably part of the house's eco credentials! We visited Isle of Lewis and Harris several times already ... and always tried to get to stay at the Longhouse. However, it was always booked out in recent years (obviously, now we know why :-) ). This year we finally managed to book a week and have our first stay at the Longhouse. It was amazing. Such a great place ... perfect location (very "central" to reach a variety of places on Lewis within shortest time), very spacious, lovely furnished with so much love in the detail. Very clean of course and perfectly equipped - in the kitchen, the bathrooms, the living areas, etc. Truly a gem with all luxury one could wish for. I was in frequent contact with Linda before and after our stay - which I really appreciated. To be taken care of in such a professional and wonderful way, that's how it should be. The evening when we arrived, Anne gave us a very warm welcome and carefully showed us everything. At no time during our stay (and before, after) we did not feel home and being part of the "Longhouse" family. We can only highly recommend the Longhouse and provide the highest and greatest praise. We will definitely come back and are already looking forward to do so! A fantastic start to our Hebridean adventure. My wife and I booked the Lewis Longhouse for a week in September as the first part of our mini-moon. Even the booking process was as smooth as silk with Linda from the Longhouse promptly replying to any queries that I had. Upon our arrival, we were met by Anne, who welcomed us warmly into the house by showing us around, making sure we were comfortable with all the mod cons and providing us with a congratulatory bottle of champers and a superb welcome pack which contained the best smoked salmon I’ve tasted (Stornoway Smokehouse). The house itself was immaculate with not a speck of dirt or dust to be seen, the kitchen had all the modern appliances which seems to be so well kept they looked brand new! There’s a modern feel about the house but it it extremely cozy with underfloor heating and a coal/wood burning stove in the living area which is great to relax in front of with a good book and a dram. I can not recommend the Longhouse enough. Yes, it may be on the lavish size cost wise but you get what you pay for. If your looking for a week of pure comfort and relaxation then the Longhouse is the place you need to book. The only thing I might add is to keep the extra firewood in the dryness of the garage. But that’s a very minor thing. From the moment we were greeted at the door by smiling Anne (the 'housekeeper"), we knew we were in for a treat. Thoughtfully planned, brilliantly constructed, and thoroughly equipped, Lewis Longhouse ranks as one of our all-time favorite self-catering cottages based on the ten years we've been summering in the UK. Linda and Paul have anticipated every possible need and desire, providing copious instructions, books and suggestions for exploring Lewis and Harris and digging beneath the surface to experience some of the Outer Hebrides reality. Anne herself is a treasure, always willing to engage and help with specific requests. Result was a magical two weeks in a beautiful spot. Hated to leave. Anne Smith -- major like! Small suggestion: The EV charger is a nice touch, but the technology isn't there yet -- EV's have a range of only 85 miles, which is makes covering the distances impractical. We exchanged our EV for a more practical Fiat 500 in order to get to the places Linda and Paul recommended. Until the range of the EVs improves, it would be nice to give first-timers a heads up on this point. I only have good things to say about staying at the Lewis Longhouse. The house provided everything I needed & more. So many thoughtful details such as food in the fridge when I arrived & excellent suggestions & directions to all the best places to visit & eat. A spotless, warm, light filled house (that felt like a home) to return to every afternoon. There is a generous feeling to the house with ample towels, luxurious bathrooms & brand new kitchen along with wifi, tv with Netflix, and a computer. I thoroughly enjoyed staying at the Lewis Longhouse, it was a wonderful base to go & explore the island of Lewis & Harris from & it felt like a treat to stay there. Having food in the fridge, especially if you arrive on Saturday night! A perfect designed modern house in a wonderful location. Equipped with everything you need. Kind support from Anne, the local housekeeper, for all our needs. Only a few meters to the lovley beach. Many sights around to be visited within an hour or two. Good supermarkets close to the house. We enjoyed the stay very much and could really relax. The view from the 1st floor over the sea is phantastic. We liked the changing color of the sea over the day. Breathtaking! A toilet paper holder at the wall would be fine. We have been traveling for a long time. It was so nice to come took comfortable cleanOasis. We would recommend this to anyone.The views were amazing. In 15 years of self catering holidays, this was the best place we've ever stayed. Couldn't have wished for more. Linda and Anne made the whole experience really comfortable and easy. We loved our stay in the longhouse-it is a modern, relaxing, beautiful space with so much light and lovely views from every room. The house is so well equipped it feels like a home-from-home and we cooked some lovely meals there...but it is also easily located to get to Stornoway for food too. Lewis is a fantastic island to explore and the Longhouse is a perfect base to do it from! Anne, many thanks for your kind comments. Hoping we can welcome you back again so you have more time to enjoy! This was our first trip to the Outer Hebrides and our experience was nothing short of wonderful. After a short stay in Harris, The Longhouse was the perfect place to relax and enjoy the beautiful surroundings - no one could ever tire of the views from the bedrooms and dining area - and was in a great spot to explore the many fantastic beaches around Lewis. We took full advantage of the suggested 'days out' guide and were never left disappointed! The Longhouse was also the ideal space and layout for our 16 and 12 year old children who basically made the upstairs room their own - for studying purposes, we'll see how that pans out and whether they just spent all that 'revision time' admiring the views of the coastline. Thanks also to Anne for a very warm welcome and the beautiful 'Easter' buns! All in all we had a wonderful stay and would highly recommend The Longhouse and Outer Hebrides - we will hopefully be back again some time in the future. The views, location and layout of the Longhouse were all perfect for a small family holiday. We all felt the house was perfect! Martin, thanks for your kind feedback. Hope we can welcome you all back again. Fingers crossed for successful exam results! Thank you Linda for a wonderful stay at the Lewis Longhouse! Highly recommended to all! Linda's great communication ensured a relaxing, comfortable stay on the Isle of Lewis. We arrived to a friendly welcome to our temporary snuggly home, wine, cheese and fresh crusty bread along with other delightful assortments. The Longhouse was warm and inviting with all the comforts of home. Loved the goody bag on arrival, and home baked goods - a very warm touch. Lovely interior decor and homely feel. Perhaps just some more information on goody bag - e.g. sharing the home with family later on, I thought my folks would have got their own bread and milk etc... just to plan a bit better. But GREAT otherwise. Beautiful sunshine through the big glass windows/doors in the dinning room - but very bright when sitting for breakfast/brunch! Almost unable to sit there - might be nice to have a shade cloth of some sort as optional when sitting there. Amazing place! You have done a wonders! Kate, thanks for your kind feedback. Yes, we have debated screening the windows against the sunshine - imagine, we are in the Hebrides, and this was February! - but haven't found anything of the right quality for the house that beats the views we would be screening too. We continue to search. We booked from Australia after viewing on the web and hoped the Longhouse would be all it was cracked up to be. It became a meeting place for us with our family and a great place to come home to after exploring the island/s. We stayed six nights in late winter and the house was warm and welcoming each day on our return. The wood/coal fire is great. The beds are very comfortable and the kitchen well-appointed and the environmental design aspect is very appealing. The longhouse is a great central location for exploring and far enough out of Stornoway to feel uncrowded. Stornoway itself has most things you will need for your holiday. Definitely recommend a stay and loved the welcome basket on arrival. Would love to go back in Spring/Summer. John, many thanks for your kind feedback. Perhaps we can welcome you back next time in summer to experience the island and the house in a different light! Fantastic location over seeing the coast with views of the sea from the house. Very convenient for shops, food and exploring the rest of Lewis and Harris. Beautiful house, with everything you need. High quality finish throughout. Support mechanism in place for any queries and advice given very promptly. Highly recommend for a peaceful retreat and recharge your batteries. Paula, thanks for your kind comments. We do have a microwave - combined with the top oven. Hope we can welcome you both back another time to test it out. The Longhouse was absolutely perfect in every way. It exceeded our hopes & expectations. It combines comfort & elegance in a unique way, & the view from the lounge of the landscape & ever changing sky, was a delight. The welcome pack was greatly enjoyed & we were delighted by the warm & thoughtful greeting by Anne, the housekeeper, who lives nearby. My family of five were welcomed by the cheerful Anne -- after several months of eager anticipation between actually booking the Longhouse in May and taking the ferry across to the island in August. The Longhouse is a short drive from Stornaway, in view of the sea and turns out to be just as beautiful as the island's landscape, historical -- and prehistorical -- sights. My wife and I, and the three youngsters with us, aged 25, 23 and 17, just loved being in the Longhouse. We particularly liked the kitchen area and the natural light pouring into the house from all directions. Whether rain or shine it was a great place to be. We loved the attention of details, be they eco-conscious, cooking-related or in the libraries of guidebooks and cooking books provided, that the owner Linda had thought about so carefully. As expat Brits based on the other side of the world in China, returning for a Grand Tour of the British Isles, and spending 60 days' touring, staying at the Longhouse on Lewis was easily the dream-home highlight that all five of us will longingly remember as the summer's paradise. Thanks to Linda for her great and easy communicating, and to Anne for making us so welcome when we arrived. We sincerely hope to return, and will surely tell our friends about this Hebridean gem. Anything more would be a super bonus. We truly loved the Longhouse. This lovely house provided everything we needed for our holiday, with excellent support from the owners and their local housekeeper. We had regular emails before we arrived with comprehensive instructions and a very useful guide. Last minute texts and the personal welcome from Anne added to the strong support. The house is a beautiful, modern, sustainable house, with everything we needed, down to the dressing gowns for lazy days! Location close to Stornoway was good for both ferry and airport and handy for shops. The outlook is spectacular overlooking the beach and fields. The house is very well equipped and extremely comfortable. Whilst it is at the expensive end of the price spectrum, it was very good value if you are looking for a comfortably luxury relaxing home from home. Lewis and Harris are beautiful with much to explore, and make an excellent location for a really relaxing break. i liked the sustainable Eco credentials and features, and also the modern design. Two bedrooms make this house small for many families so I wondered if a sofa bed or extra bed somewhere might help to accommodate more families without over crowding. The Longhouse is stunning. Not just the location but the house itself, the facilities provided, the comfort of the furnishings and the excellent help from Anne. We appreciated she was readily on hand with any questions we had and very willing to drop instantly. The flowers, champagne and '25' cupcakes for our wedding anniversary were a thoughtful welcome present together with the goody bag of delicious local products. Thank you for thinking of them - a really, really nice touch. This has certainly been the most welcoming and one of the best self catering property we have stayed in. Hi Sue, thank you for your kind comments. We love to get the chance to personalise the 'Longhouse experience' for guests and a birthday or anniversary is one chance to do that! It means a lot to know guests feel as welcome as possible - you are staying in our holiday home so that's important! We thoroughly enjoyed our recent week at the Lewis Longhouse. It's well located (close to Stornoway) and with easy access to all corners of Lewis and Harris. The excellent day trip guide that we received in advance was really handy and made planning what to do each day a breeze. The house is beautifully designed and the view from the dining area is a delight to watch as the weather continually changes. Our girls (10 and 15) loved the chill out room in the eaves where they could read, listen to music and play games. Its a very spacious house for four people that manages to be both airy and cosy - very much a home away from home. We loved the artistic and imaginative Harris Tweed elements and the bookshelves filled with interesting local books and maps. The house is very well equipped and does a great job of mixing luxury with a strong green ethos. The welcome pack is a treat and Anne, the housekeeper, couldn't have been more welcoming. All together we feel we have had an amazing experience of this wonderful part of the world. Thank you for helping make our stay so special. The welcome pack and day trip guides were great bonuses - pretty much everything was thought of which is lovely. No - its great the way it is. The Longhouse is stunning, with such good quality in the building, the fittings, the decor, the bedding, the kitchen equipment, everything is of a high standard and everything you could possibly need is there. It is very beautiful, light and peaceful, making you feel like you can breathe in and totally relax. The views are amazing and you feel you are on top of the world. So lovely to be able to wander off down to the beach. We adored our stay and wished we could have stayed longer. Anne looked after us so beautifully and was so attentive and kind. We loved our stay, more than words can say and I will ensure we return one day, as it is exaclty the kind of place we dream about staying in on holiday. Thank you for the most incredible home for our precious week. We'll be back! I / we adore feather down pillows as opposed to the foam ones we slept on, so that would be the icing on the cake!! We were very impressed with the Longhouse and it more than lived up to our expectations - we loved the attention to detail, the design and comfort of the house, and all the local tweed, soaps and produce just made it very special. You have even got an electric charging point for cars. We also loved the location with the view over the beach and bay, and it made a fabulous base for exploring Lewis and Harris. We also very much appreciated the warm and helpful welcome from Anne and her help during our stay. Overall, we really loved it and would heartily recommend this to anyone who wishes to explore these islands. It is a testimony to what you provide that we cannot think of anything to add! Hi Stephen, many thanks for your lovely, positive comments. We are delighted you both enjoyed your stay in the Longhouse and loved its location. We just aim for guests to love staying in the house as much as we do, so thank you and hope we will see you back again in the future! I booked the Longhouse in January, the communication from Linda and the pre holiday information was excellent. We were met by Anne on arrival, extremely friendly and a font of local knowledge. The house and setting are perfect, the spec is extremely high, very clean and the perfect place to relax. We used the bus multiple times and had a fantastic holiday including golf, mountain biking, a boat trip, swimming in the Atlantic and soaking up the incredible scenery and Mediterranean style beaches without the crowds. Hi James, many thanks for your kind comments. I am pleased both the journey of booking your stay as well as the experience of the Longhouse itself on the old family croft was so positive. Hope we can welcome your family back again in the future! Best in so many ways!! This property is such a beautiful home away from home. We were unwell when we arrived but Longhouse was so comfortable it was a perfect spot to rest and recuperate. Very special design, beautiful views and gorgeous throughout. Lovely design, views and decor. Can't think of a thing - perfect. Hi Jim & Jane, thank you for your so kind comments. We were so glad that you were able to stay at the Longhouse at last and enjoyed it as much as you could whilst poorly. Next time, be well so you can enjoy the island too! As mentioned in our guest book entry we all thoroughly enjoyed our sojourn on the Western Isles with the Longhouse being the icing on the cake. This immaculate property allows guests to settle in quickly and start enjoying their holiday immediately. Thoughtful details throughout the house and garage make life easy. This is a hard act to beat. We liked the building, its location and distance from the road, albeit for local traffic. The house is FULLY equiped which makes staying there easier and therefore more relaxing than in run-of-the-mill self-catering properties. No dislikes. Hi Colin, sorry for the delay in responding but thank you for your kind comments. I love that the house was the "icing on the cake" for your holiday! We just want guests to love staying there as much as we do, so thank you! And, hope we can welcome you back again in the future. Thanks for your feedback Gillian. The Longhouse is a 5-star luxury property where every small detail counts so it is disappointing you felt the towels were not up to scratch and it impacted your luxury experience. I regularly buy new, much to my husband's angst! We replace items such as towels before they no longer feels luxe and indeed have new towel and linen supplies ready always. We will no longer use those used during your week. The house has been well designed, wonderfully furnished and I have never stayed anywhere with more helpful owners. We even received a little day trip guide to Lewis and Harris which the owners had written and which we used almost exclusively. The location is reasonably remote so planning is needed for food etc but this is what we went for and the views were exceptional. Also short walk to a great beach was perfect for my energetic 6 and 4 yr olds! Black out blinds for early summer mornings with small children! Couldn't imagine a more scenic location or a nicer house to view it in. Longhouse is ideally situated overlooking a beach, just outside of Stornoway, the capital of Lewis Island in the Outer Hebrides. If there is a gadget or piece of equipment you need while on holiday, it's in the house -- extremely well stocked! The light and high ceilings are amazing. Complete instructions are left for touring around the islands. Hi Vic, thank you for your feedback and great comments. Our team-member Joanna does make great cakes for our guests! Glad you enjoyed them as part of the whole experience! The house is fitted out and serviced to a five-star standard as described. The owner has achieved the convenience and style which provides a contemporary look and ease of use with a sympathy with the local environment by use of colour hues and materials. All items supplied are of high grade and consistent with the look and feel of the house; clearly a great deal of attention has been given to their selection. There is also a shade of the owners' personalities, not too intrusive, but enough to provide warmth and character. All this seems to have been put together with the visitors' relaxation in mind and this has been very successful. The location is very convenient for transport, town, beach and country, has great views, and simply a wonderful place to be. Not really - quite consistent and consistently good. If you could guarantee the weather we had, you will have found the elixir of life! Thanks for your lovely feedback David, and Nancy. You certainly had the weather for a stellar first trip to Lewis. Hope we can welcome you back again! We stayed at the Longhouse over Christmas and it was perfect. A couple of storms were due (which disrupted the ferry crossings to the island), but Linda was very helpful, allowing us to travel a couple of days earlier to avoid the travel disruption. The house is lovely - comfortable, modern & warm throughout - and because it's Linda's Holiday home, it is furnished to a high standard. You won't be disappointed. Anne, the housekeeper was great - pointing out where we could meet Father Christmas :-), and helping us at the height of the storm (when the power went off across the island temporarily). It's pretty quiet on the island at this time of year - having said that there still are good places to eat out & visit etc., and of course you have the beaches which are just fabulous - and you have them all to yourself for walking/ playing with the children etc. The quality is second to none throughout - the whole package has clearly been carefully put together. We were lucky with the weather, sunny and warm for the time of the year. The trouble was 3 nights was not enough. We spent time exploring the island and not enough time enjoying the house. We will simply have to return! Nothing that we can think of at this moment in time. The Longhouse has a fine location in a prime position on the coast. The openness facilitated enjoyment of the wonderful light that the Outer Hebrides possesses. The selection of treats in the refrigerator were excellent! Linda even remembered my wife's birthday and included a bottle of bubbly! The house is well designed and tastefully equipped and decorated. Everything is of superb quality and easy to use. It is such a pleasure to stay in a self-catering let where the kitchen utensils are NOT cast offs! The support services work flawlessly with the premises cleaned and sheets changed weekly and the garden well maintained. Whilst not the best location we have stayed in, the Longhouse is a serious contender for the quality of accommodation award! We especially loved the cabrio balconies and sliding doors but tolerated the stag's head in the master-bedroom! It is hard to come up with this! As late arrivers it would have been nice to have been offered the option of a 40 North meal in the refrigerator. Excellent location, lovely property with everything you may want for a relaxing or active holiday. We spent a wonderful 2 weeks in September at the Longhouse, it fulfilled all of our expectations from the friendly welcome to the range of things to do. The Longhouse has been well thought out to cater for any weather; picnic blanket, swimming towels, place to dry your wetsuit to a good selection of books and DVDs (catering for all age groups). We found the walking books and maps particularly useful and covered over 100km on foot. The view from the master bedroom is stunning, it was tempting to just lie in bed and watch the weather. The kitchen was well stocked with equipment and we had plenty of good meals sat around the glass table - fighting for the seat with the best views (picture windows framed the view beautifully) and then whiling away the evening playing games whilst the sun set or wandering down for a walk along the beach. The house provided plenty of space for 4 adults to do different things - the upstairs space perfect for quiet reading or doing a jigsaw. This was a perfect holiday - which I have never said before. The option for a thinner duvet would be useful. Hi Marcel, sorry for my late response but thank you for your kind comments. We will have to look at getting a lighter duvet on offer but usually if guests ask Anne for anything she can sort it out! A nice problem to have a bedroom that is too warm [Emoji Removed]. Hope we can welcome you all back to celebrate the rest of your significant birthdays! Linda. The first time we stayed in the Longhouse, in 2014, our impression was incredible and we enjoyed little touches such as the flowers and hamper with lots of luxurious goodies in it. We were very excited to return but we have to say that this time, unfortunately, despite it costing considerably more than our previous visit, the experience didn’t quite match expectations. We arrived to find an empty vase on the table, no towels for our sons and a less generous range of groceries within the welcome pack. Although these might seem like small things, they contributed substantially to our first impressions and left us feeling slightly disappointed second time round, especially in light of price increases (we paid over £230 per night and that included a 10% discount for returning guests). We also felt that the requirement to pay an additional £90 if we wanted to use the sofa bed for our sons (my parents were joining us and used the second bedroom) was a tad excessive. There is no doubt, however, that the Longhouse offers extremely comfortable accommodation and it is very well equipped indeed. The location is very convenient, close to Stornoway, and there are lots of little touches within the house that add to a sense of luxury. We love the big windows, Harris Tweed accessories and exceptionally well designed interior. The housekeeper, Anne, is extremely attentive and responded very quickly to an issue we had with a piece of felt flapping on the roof brought on by a strong northerly wind, which prevented us from sleeping one night. On balance we would have to conclude that although the Longhouse is a stunning property with excellent customer service, it is by far the most expensive accommodation on the island and based on our experience this year, we do feel that it is somewhat overpriced. Not being able to sleep one night wasn't great but the problem was dealt with promptly the next day. Love the light, interiors, comfortable bed and garden sheep! hi Jane, I am delighted you loved so much about the Longhouse, disappointed of course that you did not feel completely positive about your experience. Our holiday home is a luxurious 5-star experience for up to 4 people. As you had stayed before, we made an exception to allow the 6 of you, including your parents this time to stay, and waived any additional cost. Extra towels are available for all guests and when you asked, Anne quickly responded. We have evolved our offering to guests at the Longhouse to avoid it being too staid, hence a slightly different, but actually higher quality/cost, welcome bag of local goodies - smoked salmon, goats cheese, black pudding, bottle of wine, local soaps, some basic groceries and a well-stocked store cupboard. Island living rarely limits us but the week you were there, the flowers available to buy were not 5-star - our housekeeper rightly used her discretion in not putting them in the house. You first stayed spring 2 years ago and we have increased prices since then, but have done so carefully to stay mid-range (not the most expensive) especially high season, for 5-star properties across Lewis and Harris, many of which just accommodate couples rather than families. it is important for us to continue to attract families to enjoy our 5-star luxury any time of year and always reduce rates for returning guests so they can come back again and again. is there anything you have not thought of to make a perfect stay? when we arrived at The Longhouse we were immediately impressed with the warmth and cleanliness of the place. Every room was cosy (Scottish summer) and the furniture very comfortable. The stock levels were by far the best we have ever experienced and as my lead states, there was nothing more could be included. There was even cornflour in the kitchen! I and my wife can only really add that this place is faultless. We had a lovely week here and would recommend it to anyone. Beautiful interior, comfortable, clean, elegant and relaxing with a view across the bay and a lovely sandy beach.Even the welcome pack was excellent with delicious local smoked salmon and goat's cheese as well as local oatcakes, bread, wine, milk and home-baked cake. The whole process was easy and Anne, who greeted us there, was very helpful and friendly. We loved the house and would be very happy to visit again at any time of year. It is spectacularly well maintained and very well-equipped. Our only non-excellent tick above is for location and that is simply because it would be even more perfect if it was on a Harris beach, but it's a good location for exploring both islands and enjoying the resources of Stornaway and the proximity to Callanish etc. We didn't feel as though we were missing anything on this visit. Thanks for your so kind comments Lyndsey. Our location on a family croft, by a lovely Lewis beach, is special for different reasons. It isn't Scarista, but we love it for its ease of day-tripping around the islands and delighted you did too. Hope we can welcome you back to enjoy it some more! The longhouse is a superb holiday cottage for exploring the Isle of Lewis and Harris. The accommodation is excellent in all respects with absolutely everything you need for your holiday provided. Highly recommended. I was completely bowled over with my whole experience of The Longhouse and the magical beauty of Lewis. The Longhouse is so well situated, with views of the beach, which is a stones throw away. The house is so light and eco friendly. Such luxury and comfort. I kept having to pinch myself to make sure it was not a dream! The raw untouched beauty of the Island of Lewis is breathtaking and the people so friendly. This is most definitely a piece of Heaven. If you want a break away from the fast pace world we live in, then The Longhouse is a definite must on your list of things to do. I think all my needs and more were catered for. Perhaps a table and chairs for the outside area would be a nice added extra, for sitting and having a meal and drinks or sundowners at. Thanks for your wonderful comments Colette. ...and, ever the optimist, we are taking delivery this week of a table and benches for outdoor eating on the lawn! The Longhouse is a stunning property that is literally full of light - huge windows and the long summer days give it an amazing outlook. The furnishings are excellent also, and it feels roomy and comfortable. We were welcomed personally and there was a welcome pack of both essential and luxury food (including delicious homemade cakes). The wifi was fast and reliable, the kitchen beautifully equipped, and everything worked beautifully. There were corncrakes nesting nearby - heard but never seen. We had a really lovely week, with plenty to do. The beaches are gorgeous (check out Luskentyre), and there is plenty of hill walking or flat walking. Callanish stone circles are amazing and there is plenty of other history to explore. It is a reasonable drive to Tarbert but the hills on Harris are well worth exploring. We spent lots of money on pictures (several local galleries), Hebridean handmade soap, and Harris tweed - will remind us of a lovely holiday. Thank you. Thank you for your kind comments Alison. We do love the light too! Great location, beautiful house, very relaxing. Everything I expected and more. Very relaxing holiday in a great location. Fantastic house with beautiful views. Loads to see and do on Lewis, we will definitely be back. Easy booking process, very professional. Beautiful scenery and the house was extremely warm and comfortable. Tiny thing but did miss my Nespresso Aeroccino for making Lattes. I took capsules but we didn't end up using them. Thank you for your kind comments, Kirsteen. And, a quick improvement for you - we haven't got the aerolatte yet, but we have moved the milk frother that we do have so it is visible by the nespresso machine! See you next time, we hope. Really a most comfortable and well equipped house. Has everything you need for a most restful time. Well situated on Lewis with open views to the sea. Instructions to find the house are detailed and easy to follow. 10 minutes from Stornaway. Lots of information in the house on suggestions of where to go and what to do. The kitchen is well equipped and the beds comfortable. Difficult to find any faults! We were met by a most friendly lady, Anne, who gave us the keys and who showed us over the house. Communication following the booking and throughout was efficient, informative and friendly. No, you are doing everything we can think of. Many thanks. Thank you for your kind comments, John. I have also passed your feedback to Anne. Thanks for your kind comments, Jenny. We will consider bikes in addition to the two we have, but it is also important to us to provide business to local services. Had a fantastic stay - luxurious yet homely Longhouse, lovely wood burner and all home comforts meant that we wanted for nothing! We loved our goodie bag on arrival especially the local cheese and home baked cakes (both delicious!). Lots of lovely walks and great info on where to eat out. Walked on coastal path from the Longhouse thanks to the tip in the days out guide-very ice for a quick loop when not wanting to go out in the car. Amazing views and we loved the thought and effort that had gone into making it an Eco friendly escape! We will endeavour to come back and will definitely recommend to friends. Thank you for a great stay. All of it but especially the glass walls with gorgeous views, wood burner and luxuriously deep bath! Perhaps a slightly larger table outside for when the weather is good as is lovely sitting out there in the sunshine. Thanks for your kind comments Cathy. And, we are looking out for a sturdy table and bench that can survive all weathers and works for eating outdoors when the sun comes out and it is lovely! A beautiful house in an amazing location, made this a perfect relaxing break away from our busy lifesyles. The welcome pack and warm welcome was also very much appreciated. We will definitely be back! Thanks for your kind comments, Rona.